The illustrious French label Record Makers—founded by the gloriously loungey AIR and home to Sebastien Tellier, Acid Washed and the subject of this post, Kavinsky—is back with another electro disco jem from the Letterman jacket-rocking, Knight Rider-channelling discoid deviant Kavinsky. This is cause for a wee bit of a stir in-and-of-itself, but when the track, "Nightcall," brings with it production from Guy-Manuel de Homem-Christo, a.k.a. the other half of Daft Punk, and groovy vocals from CSS's Lovefoxxx, things are no longer stirring, they're whipping around so much we have a disco-boogie cyclone rising from our laptop speakers. To quote from the Kavinsky bio: "The legend of Kavinsky is an interesting one—the story goes that he died in a car crash in 1986, whilst driving his beloved Testarossa. He reappeared as a zombie in 2005, with his 12-inch "Teddy Boy." Since then, he's shown up all around the globe, playing music to humans." Now ain't that interesting. I guess it'd be more fitting for him to be channelling Night Rider then. 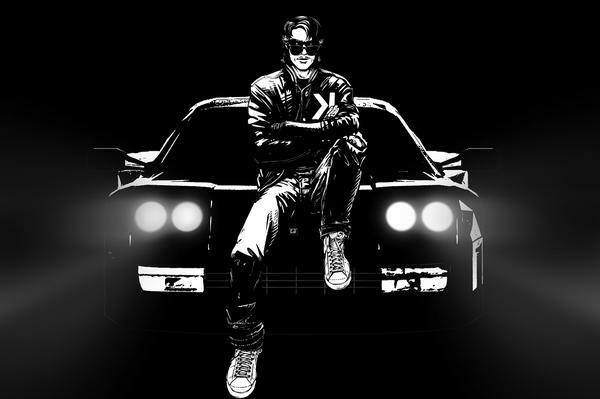 Dead or alive, Kavinsky churns out the sultry French electronic sounds that that gets our blood moving, even if his can't. And really, how could he not when he was parked in the studio with Homem-Christo. To boot there's a trio of remixes that are available for free, our favorite coming from French boogie master and Ed Banger alum Breakbot. Reminsicent of his stunning "Baby, I'm Yours" Breakbots mix is a slo-mo sultry '80s boogie number just crying out for a dance floor. When Lovefoxxx bubbles up on the refrain, any resistance we might have had to the track evaporates. And we hope it'll do the same to you, so download to your hearts content.